Market watchers use several indicators to gauge the valuation of the broader stock market. The P/E ratio (Price/Earnings), P/D ratio (Price/Dividend) and Shiller CAPE ratio (Cyclically Adusted Price/Earnings) are quite common and I will look at a fourth indicator, the percentage gain in the SP500 index over a six year period. As we will see, when gains reach a certain height, there are two alternatives that follow: 1) a crash or other steep decline in price, and 2) a flattening of price for approximately 18 months. Use of any of these indicators – PE, PD, CAPE or this one – would not have helped an investor avoid the 2008 crisis. Why? Because they gauge valuation. The 2008 crisis was a financial crisis based on bad judgment and fraud. At the time of the crisis, the index had gained 40% in the past six year period, about the average six year gain over the past 140 years. The average annual gain is a bit under 6%. The median gain is 29% over a six year period, or a 4.2% annual rate. Add in the current 2% dividend rate and the median expectation is 6.2% annual gains in the stock market based on the past 140 years. Some public pension funds are still using 7.5% expected annual gains and that will probably be the next crisis in the coming decade. Methodology. Why did I choose a six year period? Did I run a bunch of simulations to get the most dramatic period? No. It’s the first number I picked and the reason I picked it is simple: it is one year more than the five year rule. Financial advisors will usually recommend that their clients do NOT keep money in the stock market that they will need in the next five years. Why? The volatility in the market could cause an investor to sell at precisely the wrong time in order to access funds. Even at the worst depths of the 2008 crisis, after more than 50% losses, the SP500 index was only 11% less than it had been six years earlier. This is why advisors use the five year rule. 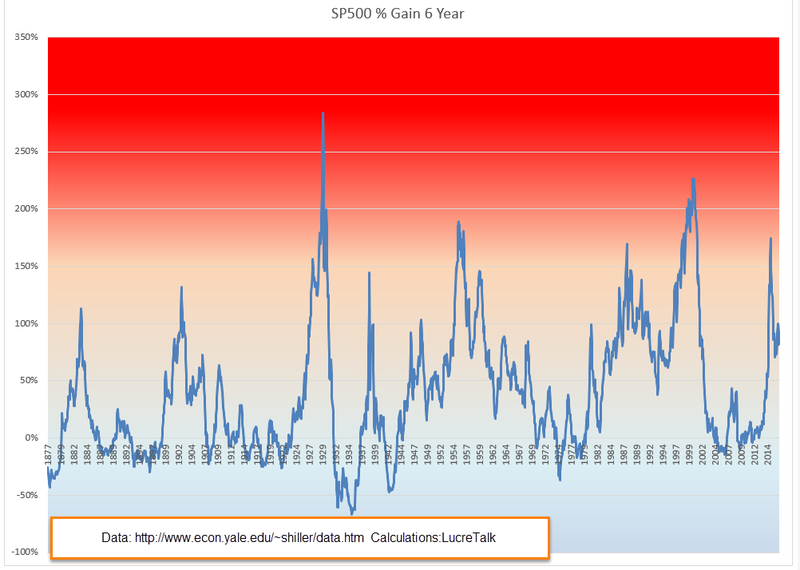 Below is a chart of the percent gains in the SP500 index after a 6 year period. I’ll call the six year gains “6Gain” to save some typing. The data is courtesy of Robert Shiller who wrote the book “Irrational Exuberance” which first introduced the concept of the Shiller CAPE ratio, an inflation adjusted P/E ratio. Let’s look at examples of steep price declines when the percent gains have just gotten too high. The 1929 crash was truly historic. That’s the highest spike in the chart above. In November 1928, the 6Gain first crossed above the 150% mark that signals an strong overvaluation. The market should have started to flounder but lax lending rules probably helped fuel further price gains. Many people with acceptable credit could borrow money against stocks and many did, chasing the strong upward trend in the market. Over the next ten months the market climbed another 20%. The decline began in mid-September 1929 (Dow chart) but was seen as a well deserved correction to the summer exuberance. At the end of September 1929, the market had gained 284% in six years, the highest 6Gain on record and a percentage gain that may go unbroken. In October 1929 the market continued to lose ground, forcing the sale of borrowed securities to meet margin calls. Margin selling contributed to the downward momentum but the sustained selling woke investors up to the fact that the market had climbed too far and too fast. The selling culminated in a gut wrenching 23% loss on Black Tuesday, October 29th (Account of crash – I disagree with the author on valuation). It took 18 months for the market to correct to a 6Gain that was average (39% over 140 years). By that time in May 1931, the market had lost 55% of its value. From 1931 to 1936 any money invested in the stock market six years earlier had shrunk. In 1934, six year LOSSES, not gains, approached 60%. My parents grew up during the Depression and were taught that the stock market was a reckless gamble made only by rich people who could afford to lose some of their savings. These overvaluation crashes are rare, thank God. The next one came more than 50 years later, on “Black Monday” in October 1987, when the index lost 20% in ONE DAY, almost as much as Black Tuesday in 1929. At that time, the 6Gain was 169%. I can still remember where I was when that one went down. Traders could not get some of their orders filled and that began a panic in the market. Some radio pundits warned of another depression. I had no savings in the market but I was worried that my relatively new business would go belly-up. Most of the 24% lost in two months was done in that one day. It took a whopping six years for the 6Gain to fall to average. Those are the only two examples of severe price crashes because of overvaluation. The more common result of overvaulation is a plateau, a flattening of prices for about 18 months, followed by by a fork – up or down. The price plateau simply tells us that a fork in the road is coming. The over-valuation tells us to expect a price plateau. Let’s look at the dot-com boom in the late ’90s. At the end of 1994, the SP500 index closed at 460. Less than six years later, in the fall of 2000, the index crossed above 1500, more than triple the price in that short six year period. The 6Gain peaked at 227%. At mid-1999 the SP500 started to stall out above 1350. Promises of huge profits to be made by internet companies were beginning to evaporate as those companies burned through cash at an alarming rate in their effort to capture a segment of the market. It would take another year before the market peaked near 1500. By the end of 2000, eighteen months on this rounded plateau, prices were about 1350 again. For almost two years they declined till the index had lost more than 40% of its value. Coincidentally, this low was reached when the 6Gain finally dropped to the 140 year median of 29%. Let’s look at some older and milder examples to develop some context. In mid-1955, the index had gained almost 190% in six years. It continued to climb for another 6 – 8 months before falling back. In the spring of 1957, the index stood at the same level as it had eighteen months earlier. In mid-1959 the index had gained almost 150% in six years. The index lost 10% over the next 6 months but by early 1961, about 18 months later, the index had gained back its lost ground. In mid-1938, we see the same price plateau after a six year gain of 150%. As we can see on the chart, these 6Gain spikes are infrequent. Now let’s look at the most recent spike in the 6Gain – March 2015. The SP500 index was near where it is today. In fact, this may be the flattest price plateau in history. The stock market was overvalued but with bond yields so low, where was an investor to go? Real estate, commodities, gold and other alternative investments have gone up and down the past 18 months as traders tried to take advantage of mis-matches between expectations and reality. The trend for the average investor? No trend. During this 18 month plateau, the 6Gain has fallen to 82% – a good sign – but still twice the average 6Gain. Wouldn’t it be nice if there was a law that the 6Gain must fall to the average before the stock market takes on a definite trend in either direction? No such law. What we do see with ironclad regularity is a price plateau when the 6Gain crosses above 150% and that the plateau lasts about 18 months. It has been 18 months and we should be nearing the edge of that plateau. Trump has been losing ground in recent polls, enough so that the Senate seems more likely to turn Democratic. This Senate cycle favors Democrats who have fewer seats up for re-election than Republicans. In 2018, the cycle will favor Republicans. As the gap in the polls widens, some begin to fear that a rout in the Presidential race could cascade into the House where Republicans hold what seemed to be an impregnable lead of 60 seats (Wikipedia article). If the Democrats should take the House, they will control the Presidency, Senate and House. Tax increases on those with upper incomes would be a certainty for 2017, as Hillary has promised. This could cause a rush of selling in 2016 to avoid higher capital gains tax rates. An unlikely but not impossible scenario may be contributing to the hesitation.